Long ago, in the magical land of Ennistymon, two conventions were organised by the mystical Tri-Chair. Sadly, much of what came to pass there is now obscured by the mists of time, but to this day we still continue to build on the Traditions that were laid down by these two conventions. Expanding on the success of the first two IDWCons, the Tri-Chair moved IDWCon to a larger hotel with better transport links, to accommodate demand. You can find out a bit more about what happened on that convention's aftermath page. In 2015, Captain Shivers took over the reins, relocating to the people’s capital: Cork. The theme of this convention was the Watch Open Weekend, and we all had a lot of fun being drafted in as Special Constables to investigate an ‘orrible murder attempt. You can get a feel of the convention by looking at the old website – see especially the 2015 Aftermath page. Still in Cork, the IDWCon 2017 was themed as the Unseen University Open Weekend. Over the course of the weekend, the various academic delegates (attendees) helped us reassemble Hex after a catastrophic Hexplosion (and that was only the start of the Hex puns). You can reminisce nostalgically over at our our previous website. 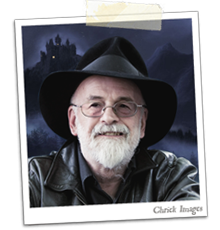 Sir Terry Pratchett – The man, the myth, the legend. Author of the bestselling Discworld series, as well as numerous other books for both young adults and grown-ups. Award-winning documentary maker. Tireless campaigner for Alzheimer's awareness, assisted dying, and orangutans. Journalist, Knight and probably even Blackboard Monitor. But you knew all these things already – he's the very reason that there even is an Irish Discworld Convention. He sadly passed away in March 2015, but we continue to speak his name. He attended the inaugural IDWCon in 2009, and conducted exclusive video interviews at both the 2011 and 2013 IDWCons. Ian Mitchell – Chief of Design and Production at the Discworld Emporium. 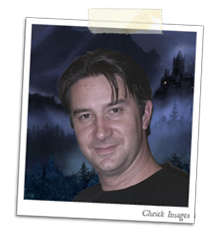 With a background in fine art, roguish Ian joined the Discworld Emporium in 2007 and has risen through the ranks to become the Emporium's chief of design and production. 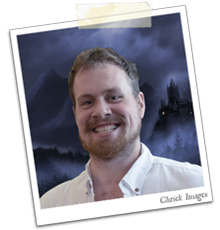 Along with creating official Discworld merchandise, Ian has lent his skills to providing illustration and art direction for Discworld board games, apps, and publications including The World of Poo, Mrs Bradshaw’s Guide, The Compleat Ankh-Morpork, Discworld Diary 2015 and The Discworld Atlas. 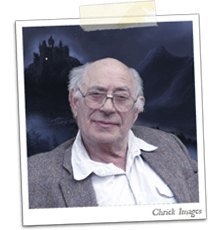 Jack Cohen – Co-author of the Science of Discworld books. What can we say about Dr. Jack Cohen that doesn't make it seem like he has lived the lives of three (very accomplished) people? His C.V. runs to an impressive seventeen pages that include his experience and qualifications obtained over fifty years of educating some of Britain’s finest – including one (so far) Nobel Prize winner. He first collaborated with respected mathematician Ian Stewart in 1991 on a paper entitled Chaos, Contingency and Convergence, which led to many more papers and eventually, in 1999, to The Science of Discworld and its three sequels, as well as two other Sci-Fi novels (Wheelers and Heaven) and sundry other articles and books on a variety of subjects. 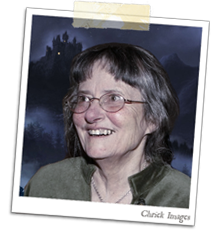 Jacqueline Simpson – Folklorist extraordinaire, and writer of the Folklore of Discworld. Jacqueline Simpson is a researcher and author on folklore and legend. She studied English Literature and Medieval Icelandic at Bedford College, University of London. Since then, she has been an active member of the Folklore Society, having served at various times as Editor, Secretary, and President, and has written many books on various aspects of folklore. She has been a point of reference for Terry since he met her at a book signing in Worthing, her home town, in 1997 - which then led to their collaboration on The Folklore of Discworld in 2008; her talks and storytelling sessions have been a fixture of Discworld Conventions ever since. She has also been known to participate in the odd game of Werewolf. Reb Voyce – The one who actually gets things done at the Discworld Emporium. Reb absconded from a career in broadcasting to join the Discworld Emporium team in 2008. From casting and painting the “Unreal Estate” sculptures of Discworld's Guilds and landmarks, her aptitude for scheming and plotting soon had her out of the workshop and managing the Emporium shop, website and social media. Reb also enjoyed a brief stint as Terry's hairdresser, accompanying him to appointments and tackling the fan-mail mountain, but such ventures were mostly an excuse to go to the pub. Rob Wilkins – Sir Terry’s P.A., and international man of mystery. Being Terry's PA, Rob has been a central figure in Discworld for some time now, and is probably the busiest guest at any convention. No lounging around the lobby playing Werewolf for him - he's got movie producers to wrangle and top secret business calls to make. He is also 33% of the Pratchett-based production company Narrativia (which is at this very moment in the midsts of creating such televisual delights as the upcoming Good Omens and The Watch TV shows). But the best thing to say about Rob is he's really nice, super fun and is always happy to chat - at least, until the next interruption! Stephen Briggs – Creator of Audiobooks, Plays, Mappes, Companions and more. Stephen and Terry played together on Discworld for 25 years and had a lot of fun along the way. They built a city on a brownfield site, then mapped a world to put it onto. With nothing else to do with their spare time, they wrote the Companion, several diaries, another map and a cookbook. Stephen has also recorded more than thirty unabridged audio books for Isis, AudioGo & Random House (UK), and Harper Collins & Random House (US), winning several industry awards that he’s secretly very pleased with. It’s plays, though, that got him into Discworld, and he’s adapted, and published, around twenty Pratchett novels, which have been staged in more than 22 countries. 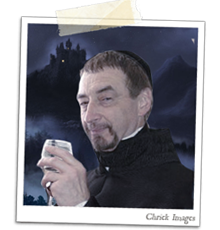 Although he is still cheaper than Charles Dance and Jeremy Irons, his tragedy is that the only way he can get cast as Vetinari is to direct his own plays. 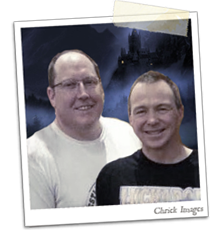 Backspindle Games – David Brashaw and Leo Boyd, creators of the Discworld board games Guards! Guards! and Clacks. Leo and David collaborated since the 90's to produce the Guards! Guards! board game, which after many years of revisions and updates was released in 2011. Since then, Backspindle Games has gone from strength to strength, including winning the UK Games EXPO ‘Best New Family Game Award’ for their game Luchador!. 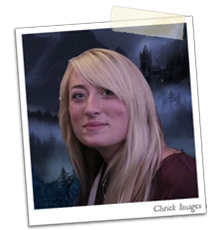 The 2015 IDWCon was the host of the official launch of their second Discworld boardgame, Clacks – which had artwork done by Amber, our very own Con Artist!